Arm-chair admirals will enjoy this fast-moving game of naval strategy. Played with two opposing fleets, ships are strategically placed on different squares on the game board. A three dimensional center divider prevents each player from seeing the location of opponent's ships. 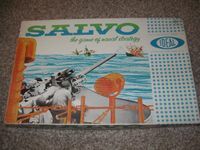 Aalvos of shots are "fired" by each side with players attempting to locate and sink the opponent's eight ships. A game unequalled in maritime excitement.